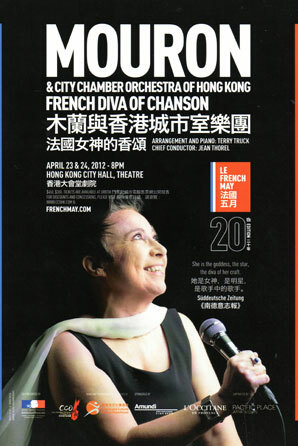 To celebrate its 20th edition, Le French May, one of the major arts festival in Hong Kong and Macao, proposed to the singer Mouron to choose 20 favorite songs from the immense repertoire of French chanson, and to interpret them with the Hong Kong City Chamber Orchestra led by the French chief conductor Jean Thorel. In order to give these 20 great classics a modern and artistic coherence, Terry Truck, her pianist and artistic director, completely rearranged them. 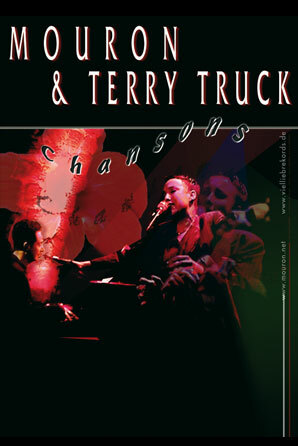 A double CD, recorded in live, from these two concerts in Hong Kong in Avril 2012. It was released in November 2012. This show is available in voice and piano variation and has toured around France (Festival d’Avignon), Germany, Asia (Philippines, South Korea, Malaysia, Taiwan, China), and Africa (Ghana). A Hollywood producer once asked to Edith Piaf if he could make a film of her life. But her reply was simple: «if people want to know about my life, all they have to do is listen to my songs». From «La Goulante du Pauvre Jean» who is nothing without love to the implacable “Je ne regrette rien”. Piaf said little, but sang everything. The Passion of Piaf tells a true story that sounds like unbelievable fiction: of little Edith, born in the poor districts of Paris, the singer of the streets who became the international star. The Passion of Piaf breathes new life into this extraordinary destiny, this enormous hunger for life, this thirst for love, this existence filled with pain and PASSION. In the whole world, Edith Piaf is a symbol, the icon of French Chanson. 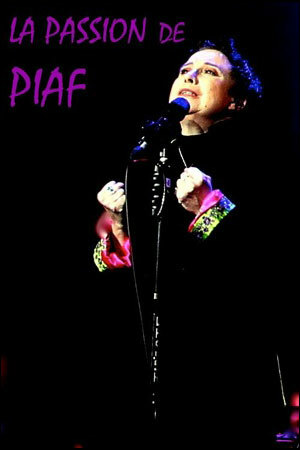 Mouron, accompanied by her loyal accomplice, the pianist Terry Truck, gives testimony to this story of passion and shines her own personal light on Piaf’s songs. The Light Years Café production was born out of Mouron’s songs, those she wrote herself and those she loves best, from those she started to write in the days of « Big Bazar » through to those she is writing today. “I thank you, this justifies fifteen years of love”. These were the last words pronounced by Jacques Brel one evening in October 1966 for his “last Première” in the Olympia in Paris. 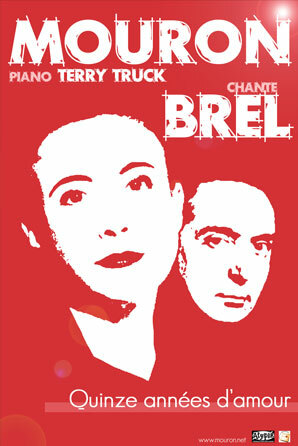 More than simply a recital, this show is a journey through a very unique personal story, the life and work of Jaques Brel. It is an original production composed from the songs, quotations from the artist, anecdotes and comments from his contemporaries. Brel said “people are unhappy only in so far as they do not pursue their dreams”. One of Mouron’s dreams was to create this vibrant musical homage to the man who’s work she has never ceased to explore, her great soulmate, Jaques Brel.